ICD Codes, International Classification of Diseases codes, are found on patient paperwork, including hospital records, physician records, and death certificates. The tenth version of the code currently in use is called the ICD-10. The United States has used the new ICD-10 codes since October 1, 2015, the classifications of which are provided by the Centers for Medicare and Medicaid Services (CMS) and the National Center for Health Statistics (NCHS). There are over 70,000 codes in the ICD-10, up from around 14,000 codes in ICD-9. ICD codes could be important to you for a variety of reasons, from the reimbursement of medical expenses to ensuring the standardized treatment is delivered among multiple providers. When your doctor submits her bill to insurance for reimbursement, each service described by a CPT code must be matched to an ICD code. If those two codes don't align correctly with each other, payment may be rejected. In other words, if the service isn't one that would be typically provided for someone with that diagnosis, the doctor won't get paid. For example, the doctor could not typically submit a bill for an X-ray if the patient's complaint was a rash. If you have a chronic disease, once an ICD code has been assigned, it may affect the treatment you receive if your provider looks at the code. That would most likely happen in a hospital where a doctor who is not the one who usually treats you (a hospitalist) or with a doctor who reviews your records before he sees you. In a hospital setting, an ICD code can be a good or a bad thing. It could prevent you from getting contraindicated treatment or allow a hospital to provide (and bill for) an indicated treatment even if even if it is not needed. If you have a rare disease, then your ICD code may be used to admit you to a clinical trial. An ICD code may also appear on a death certificate. ICD codes are used to track causes of death, but that coding more likely takes place after the death and is not always recorded on the death certificate. ICD-9 codes and ICD-10 codes actually look quite different from each other. ICD-9 codes, which you'll find on current paperwork, were phased out in 2015. However, you'll still find ICD-9 codes on paperwork until then, and you'll see them recorded for deaths. Some ICD-9 codes have "V" or "E" in front of them. A "V" code is used for health services (usually preventive) that don't require a diagnosis. An "E" code describes an environmental cause of a health problem, such as an injury or poisoning. Old ICD-9 codes are being replaced by ICD-10 codes. There are a number of changes to the system, and that includes the codes themselves. ICD-10 codes are approached differently and are quite different from their ICD-9 counterparts. These codes are broken down into chapters and subchapters. They are comprised of a letter plus two digits to the left of the decimal point, then one digit to the right. The letters group diseases. All ICD-10 codes will begin with a letter of the alphabet, each of which describes a specific condition, organ system, or characteristic of a condition. 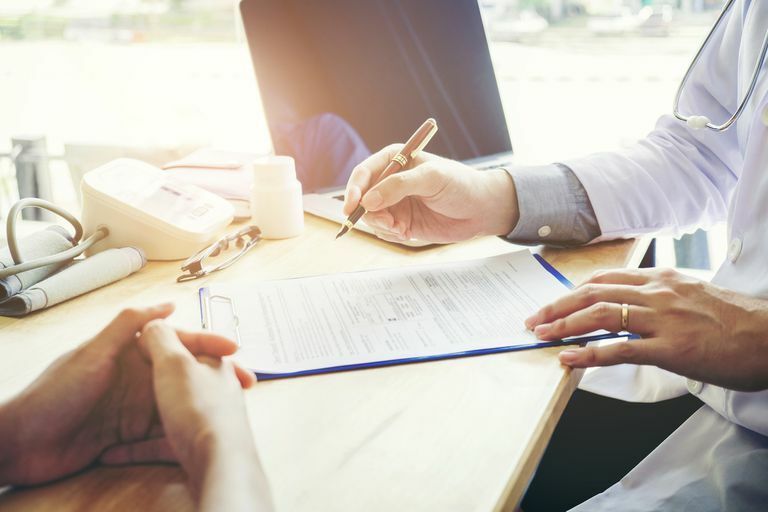 As we leave a doctor's appointment, check out of the hospital, or any other medical facility, we are handed paperwork that, to the professionals, is a numeric summary of the services they provided to us. The codes with decimal points in them are the ICD codes. They may be designated as "Diagnosis" or "Dx" (shorthand for diagnosis. )There are other codes on that paperwork, too. Some may be CPT codes, which may have numbers or letters and won't have a decimal point. When we receive an EOB, Explanation of Benefits, from our payer (insurance, Medicare or others), then it will show how much of each service was paid for on our behalf. Each ICD code will be aligned with its CPT code. Both must be listed in order for the doctor to be paid.